The students have had a great time celebrating Seachtain na Gaeilge this year. We have been making a special effort to speak as Gaeilge as much as possible over the past fortnight. The classes have all learned lots of Irish songs and poems. Sarah has been teaching all of the classes some céilí dances and the children have really enjoyed it. To end Seachtain na Gaeilge, we celebrated with a Lá Glas. 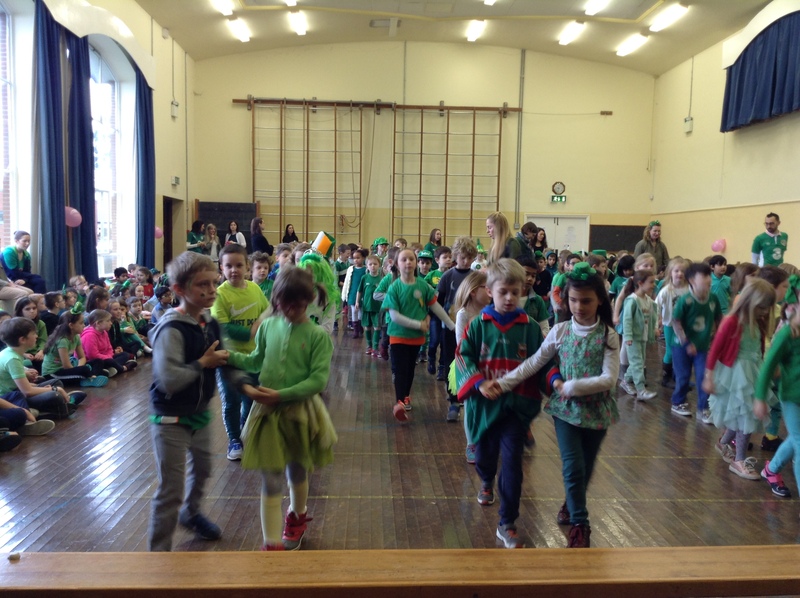 The children dressed up in green clothes and we had a céilí and ceoilchoirm in the hall. Each of the classes performed a song or poem that they had been learning. Junior infants, Senior Infants and First Class performed the traditional céilí dance ‘Shoe the Donkey’. Second class danced to the Walls of Limerick and our Third and Fourth classes danced to the Seige of Ennis. We had some amazing Irish dancing performances by Lily, Maja, Alisa and Eva from Second Class. We were wowed by the musical prowess of some of our Fourth Class students. Joseph played the banjo, Kian played the violin and Carla played the flute. Bhí craic agus ceol againn! !